His father never ate because of an old injury from the war. "I was the dutiful son, overcompensating for the loss in obvious ways. That was the only time I ever made him happy." The ceremony for his father was brief but poignant. 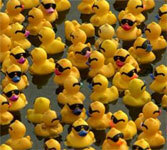 The rubber duckies collected lovingly in his lifetime were set free in the bay. They bobbed joyfully, free of the past.